[This post is brought to you by Annabel Monroe. Alright, alright – I said easy steps and it’s true. The steps are simple enough, but it takes discipline and determination to get there. We are a dual active duty Air Force couple, real estate investors and parents to three rambunctious little boys, so we know a bit about discipline and determination. Today, I’d like to share three tips that have helped along our journey. We’ve been programmed to value quantity, name brands, and other “stuff.” Reality is, that we don’t have to be keeping up with the “Joneses.” We don’t require the latest updated phone or car. Our kids will be happy with a few thoughtful gifts on special holidays, the entire room doesn’t have to be stacked to the brim with presents. I started by evaluating what we were actually using as a family and what we valued most. Be that clothes, toys, shoes or technologies we had TOO MUCH. Some things weren’t even used and others didn’t add value to our lives. Now, we keep things simpler. We focus on traveling, family vacations, National Parks and showing the boys how amazing this world is. We still celebrate every holiday and I still love to host a good party, but we focus on building memories, not stockpiles. Of course, we’ve still collected an entire bin of dinosaurs! We’re also working on collecting assets. This was intuitive to my husband, but was a bit more difficult for me to grasp completely. An asset is something that can provide future economic benefits such as cash, inventory, accounts receivable, land or buildings. Or more simply stated, anything that puts cash into your pocket. While a liability is an obligation or money that must be paid. Simply put, anything that takes cash out of your pocket. By collecting liabilities, we often incur debt that has no return or potential for appreciation. By collecting assets, we increase our worth, build wealth, and earn a return on our investment. The asset class that we chose is real estate. In 2014 we began investing in single-family homes and multifamily properties. We own 15 units – 1 single family home, 3 duplexes and most recently 2 fourplexes. Click the image for the forums & podcasts. We started by finding a mentor, who happened to also be a retired Chief Master Sergeant, by searching online, and by reading books. BiggerPockets.com led us to a book that changed our lives called Rich Dad, Poor Dad by Robert Kiyosaki. We’ve each used our VA loan, which is an amazing benefit for veterans. It can be used on up to a fourplex for any property intended to be your primary residence. Now, on top of our careers in the Air Force, we specialize in buying distressed homes, rehabbing and renting out multifamily properties. After the purchase of our first property, we built an in-depth understanding of contracting, construction and renovations by doing most of the work ourselves. We quickly picked up a few more deals and built confidence in our numbers and systems to meet our investment goals. We are now able to share investment opportunities with our network and have doubled our portfolio this year. There are many different investment vehicles, ways to diversify a portfolio and opportunities for beginners to learn! Hopefully, the fact that you’re here and exploring the military financial independence movement means you’re not afraid to learn. A huge part of preparing for our first few deals was having cash set aside to begin our journey and a plan to get more cash, both were facilitated by living within our means. In line with ditching consumerism, focus on living within your means. I used to think that having a budget wasn’t important. I’d say to myself as long as the bills are getting paid money comes in and money goes out. But this was negligent and lazy on my part. I was less disciplined than I should have been and wasn’t aware of or in control of our money. And that’s what budgeting is to me now – empowerment, education, and control of our money. It doesn’t mean that I have to stretch $10 for three months to support my latte habit, but it does mean I am tracking and forecasting spending, bills and other expenses. There are many schools of thought on credit cards and loans. Our school of thought is to employ credit as a tool to meet our investment goals. As long as we are utilizing our lines of credit to build assets, we are in line with our goals. If we are using our credit card to pay for vacations, to stretch out payment plans with high interest rates, or to purchase liabilities, we view that as living outside of our means. To us, living within our means doesn’t mean denying yourself, it’s more about expanding our means to fit what we need. We expanded our means by acquiring assets. Our marriage and business are partnerships, we are often still learning and striking a balance between splurging vs. saving or frugal living vs. fancy feasting. We discuss finances openly and honestly. We work together to build financial literacy in the boys and among our friends and colleagues. We work as a team to secure our financial freedom and we hope you are on a similar journey. If you’d like to follow our journey check out Monroe Brothers Investments or follow us on Facebook and Instagram at Monroe Brothers Investments. 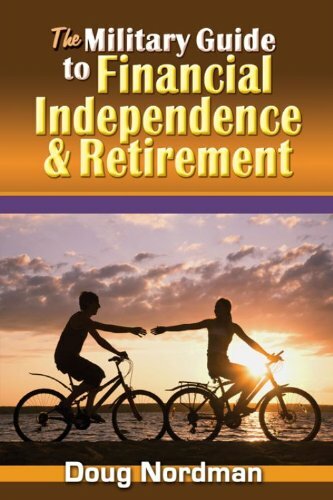 The Military Guide to Financial Independence and Retirement Price: By Doug Nordman: This book provides servicemembers, veterans, and their families with a critical roadmap for becoming financially independent.